MIAMI -- When it's all over, Sunday may end up essentially being the true start of the Miami Heat's season. Those first 2½ months and 43 games could end up having been just a quasi-extended training camp. Heading into the week, the Heat had played the league's easiest schedule (their opponents had a combined .472 winning percentage) because of a combination of chance and design. The schedule makers backloaded many of their premier games for television purposes, saving the prime matchups for after the end of football season. And the Heat have played an Eastern Conference-heavy schedule thus far -- just take a look at the standings to know what that means. After weeks of clearly struggling with motivation, the Heat are about to have plenty of it put before them. Sunday's strong 113-101 victory over the San Antonio Spurs kicked off a stretch where the Heat will play teams with winning records in seven of 10 games. Not by accident, eight of their next 12 games are on national television. Mike Ehrmann/Getty Images Dwyane Wade came off the bench for the first time since 2008 in the win over the Spurs. More importantly, Sunday was also the first day the Heat had their full roster since the start of the season. Though they're hardly alone in that distinction, with the league ravaged by injuries to stars, the Heat had a rather large variable in play because of the recent appearance that Greg Oden could end up being a factor at their weakest position. The Heat have been rapped across the knuckles recently for what has been dubbed a "malaise" as they've swallowed nine losses against teams with losing records. What that fails to recognize is that the Heat were actually two games better this season through 43 games than they were last season. There were plenty of "what the?" games in the first few months last season as they struggled to get traction after winning the 2012 title. It was last season in their 44th game when they truly got serious, after a losing road trip. It started Super Bowl weekend and they eventually reeled off 27 wins in a row and found a rhythm that carried them to another title. It's Super Bowl week again and the Heat have those several reasons to start getting serious, including a 2-4 road trip that ended grimly last week. Forget about another one of those crazy winning streaks (though the current one is at three and counting) but it wasn't hard to miss how the Heat seemed to start to depress the gas against the Spurs. Leading by 29 points at one point before the gap closed in garbage time, they delivered one of their most impressive performances of the season and their first quality win of the new year. It wasn't a sterling defensive performance -- those have been particularly elusive for the Heat this season and what they are really looking for -- but there was no missing their increased intensity. "They came with their A-game," Spurs coach Gregg Popovich said. The Spurs played without three core players in Kawhi Leonard, Danny Green and Tiago Splitter. Leonard and Green were huge factors against the Heat in the Finals last season so there is simply no way to properly evaluate this contest in that context. The Spurs have struggled against top teams this season, now an ominous 1-10 against the Oklahoma City Thunder, Portland Trail Blazers, Houston Rockets, Indiana Pacers, Los Angeles Clippers and Heat. From the Heat's perspective, though, there was no missing the sense of the sleeves being rolled up. That was personified in the decision to bring Dwyane Wade off the bench for the first time in a game since 2008. 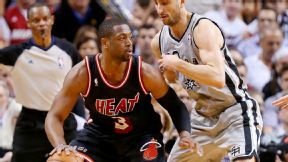 "I don't have an ego like that," Wade said about not starting after missing the previous four games. "I've been off for a while and these guys have been in a groove, and I didn't want to come in and mess that up." Coach Erik Spoelstra sold it as Wade's decision to not mess with the team's flow, but that seemed to ring a little hollow. Wade has returned from numerous injuries or rest periods in the past few seasons and had never come off the bench. It seems more likely that now that he has a full roster, Spoelstra is beginning to seriously experiment with what might work best as the Heat truly begin their run toward the playoffs. Last week, LeBron James lamented how much of a challenge it was to deal with the yo-yoing of Wade coming in and out of the lineup as Wade dealt with ongoing knee issues. While Wade has been out recently, Chris Bosh has been on a hot streak that continued in this win as he nailed 9 of 10 shots on his way to 24 points. Wade has famously missed 13 games this season, each seemingly coming with its own news bulletin. There are likely more to come and the Heat could be at the start of trying to see how they can manage that reality by using Wade off the bench so their starting lineup can retain some stability. "[The knees] are covered too much, people can think what they want," Wade said Sunday. "I live under my own umbrella, I do things that make me happy. This was best for my team and I've got a bigger picture in mind." If that sounded defensive and portended this might be more than a one-game trial, well, people can think what they want. As he's struggled with depth on the wing and production in his smaller lineups, Spoelstra has slowly been moving away from the "positionless" system that won the past two titles. Especially with a real center option in Oden in the mix -- he played 13 more effective minutes Sunday with three points, two rebounds, a steal and a block -- the Heat have been playing more traditionally. Bosh has played more minutes at power forward, his natural position, over the past month than he'd played all of the previous season and a half as Oden and Chris Andersen have been logging minutes at center alongside him. Bosh has responded with some fantastic play, enjoying not having to spend as much time guarding bigger bodies. "The comfort level is there," Bosh said. "I'm trying to make the integration as seamless as possible." These are sensible ideas for Spoelstra, who has seen both Ray Allen and Shane Battier have less-than-stellar seasons to this point. That has made it harder for the Heat to play the style that served them well the past two seasons. Also, it's no secret the Heat are already preparing themselves for a matchup with the Pacers and their textbook style of play. Spoelstra isn't comfortable discussing it -- it's strategy after all -- but revealingly uses the coverall of saying his recent moves are "another layer of our reinvention." Call it whatever you want, the Heat's real ramp-up to their title defense is on. Wade's move to the bench and Bosh's return to power forward may last or they may not. What seems like it may be here is stay, though, is the Heat's interest in the season. "I loved the way we approached this game," James said. "I think Spo has a good grip on it." MVP: OK, it wasn't 62, but Carmelo Anthony still scored 35, had five assists, and his two clutch buckets against an overmatched Ryan Kelly helped the Knicks pull away in the final minutes. X factor: Tim Hardaway Jr. netted 18 points off the bench -- 14 over a 4:40 stretch from the end of the third to the beginning of the fourth -- including a rim-rattling alley-oop dunk that was New York's sole fast-break bucket. That was ... [ ]efense: As befits their reputations, neither the Knicks nor the Lakers closed on wide-open 3-point shooters or rotated to defend at the rim. It was certainly exciting, but in a "Remember the ABA? That was fun," kind of way. MVP: Anthony Davis was everywhere on the court Sunday, adding flash to some impressive substance. Davis scored 22 points, grabbed 19 boards and swatted 7 shots, but it was a sick jam that he had over Louisiana native Glen Davis that will keep Big Baby up late tonight. X factor: The Magic went on a 9-0 run that cut the lead to 4 early in the fourth quarter. That's when Tyreke Evans stepped up and scored 10 straight points. Davis was fantastic, but the Pelicans don't come close to winning this game without Evans' 23 points, 7 rebounds and 7 assists. LVPs: The Magic bench. Orlando's starting five played well enough to win, but the bench decided not to show up and that cost the Magic. The reserves shot just 4-for-13 and were outscored 42-8 by the Pelicans' bench. MVP: Can "nostalgia" be an MVP? No? Then we'll give it to Andray Blatche, who scored 17 points off the bench in a game that was dominated by narrative, not by offense. The Nets and Celtics shot 39 and 37 percent from the field respectively, so Blatche's offense was a necessity for Brooklyn. Turning point: The Celtics were threatening to ruin Paul Pierce and Kevin Garnett's homecoming, down by 3 with under a minute remaining, but Garnett picked Rajon Rondo's pocket and dribbled the length of the floor for a game-clinching slam. That was ... a little dusty: An ugly game offered plenty of nice moments. Celtics fans were treated to two tribute videos and cheered deafeningly for Garnett and Pierce during introductions, changing tack on a dime to boo Nets coach Jason Kidd. MVP: Dirk Nowitzki with 28 points on 10-of-16 shooting, 9 rebounds and 4 assists. Dirk shrugged off four straight poor shooting performances to torch the young Pistons frontcourt. LVP: Two days after a 20-point, 21-rebound effort, Andre Drummond was disappointingly quiet against a weak Mavericks frontcourt, scoring only four points and grabbing six rebounds. X factor: On his 37th birthday, Vince Carter showed there's still plenty of life in his legs, scoring 13 points, grabbing 5 rebounds and making 3 assists. Carter's ability to drive, draw fouls and make the right pass helped keep a spry Pistons team at bay. MVP: Chris Bosh had a great game. He had 24 points, 5 rebounds and 3 assists in just 26 minutes, and even more impressive, he went 9-of-10 from the floor. The Heat ran away with this one in the third quarter, and Bosh didn't even have to play in the fourth. Defining moment: The short-handed Spurs managed to keep things close in the first half, but Bosh, LeBron and friends put the pedal to the metal after the break. Miami outscored San Antonio 33-21 in the third, pushing an eight-point halftime lead out to 20 points by the end of the frame. That Was ... Unfulfilling: The Spurs were without Tiago Splitter, Danny Green and Kawhi Leonard; the Heat brought the hobbled Dwyane Wade off the bench. Hopefully you weren't expecting a rematch of NBA Finals intensity, because this was far from it. Currently, neither team is what it'll likely be come springtime. Curry had 38 points, 8 assists and 7 rebounds, lifting the Warriors past the Trail Blazers 103-88. The newly elected All-Star starting point guard shot 13-of-23 from the floor to carry the load. Jeff Green, Celtics: Green went 2-for-13 shooting in a 85-79 loss to the Nets. Not many in Boston may have noticed the clunker, since the fans were cheering the return of Kevin Garnett and Paul Pierce. "I was probably like five seconds from shedding [tears]. I was five seconds, I'll admit to it." 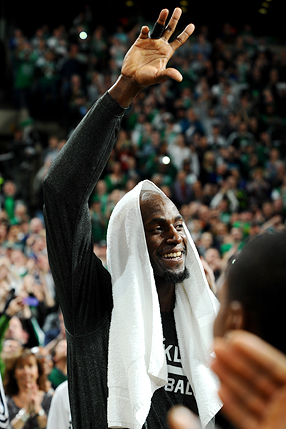 Steve Babineau/Getty Images In his first game back in Boston, Nets forward Kevin Garnett salutes the crowd after a video tribute during a timeout of Sunday's Celtics-Nets game. Carmelo Anthony followed his 62-point tour de force by scoring 35 points in the Knicks' 110-103 victory over the Lakers. Anthony, who scored 30 and 34 points in his two previous games versus L.A., became only the second player in Knicks history to record three straight 30-point efforts against the Lakers. The first was Walt Bellamy, in a span of 25 days during the winter of 1966. MVP: For whatever reason, Markieff Morris, despite his resurgent season, has gotten little love as a potential Sixth Man of the Year. He did everything to make his case tonight, scoring 27 points, shooting 10-of-12 from the free throw line, and snaring 15 rebounds. Defining moment: They say bad things come in threes. The Cavaliers led by as many as 20 points in the first half. However, once the third quarter started, the Suns went on a blistering 25-6 run led by Channing Frye's three 3-pointers. That was ... scary: It's an understatement to say this hasn't been the season the Cavaliers nor their fans expected, and when Anderson Varejao went down with what looked to be a knee injury, it seemed as if the basketball gods were just rubbing salt in the wound. Luckily, Varejao got up and stayed in the game. Whew. MVP: Steph Curry. The Western Conference's starting All-Star point guard continues to be the motor of his team's offense, racking up 38 points and eight assists. LVP: LaMarcus Aldridge. The Blazers' most important offensive player struggled in this contest, collecting only 10 points on 2-for-14 shooting. That was ... a slump-breaker: The Warriors snapped out of an extremely uncommon three-game losing streak at the Oracle, and they did it with their outstanding defense. They allowed just 33 points in the second half and held Portland to a season-low point total. MVP: Ty Lawson led the way for the Nuggets. Denver's starting point guard had an efficient scoring outing against Sacramento, finishing with 27 points on 9-of-15 shooting and six assists. Isaiah Thomas tried to match Lawson's offensive production, but had no answers defensively, leading to Lawson's big night Sunday. That was ... an offensive affair: There was very little to no defense played between the Nuggets and Kings. Both teams shot better than 50 percent from the field the entire game and combined to score 242 points.